West Shore Technologies' revolutionary iPad scouting app will have player data for all “Rising” events. West Shore Technologies, Inc. today announced a partnership with Jake Reed and Nike Blue Chip Rising senior, junior, and sophomore lacrosse events in June 2012 and the new Rising freshman event in July 2012. The partnership will enable college coaches using SportsBoardTM Lacrosse Scout, West Shore’s patent-pending iPad scouting and assessment application, to obtain player profile data that will then be pre-loaded in their iPads. 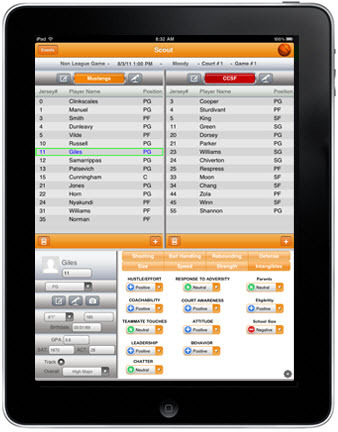 Lacrosse Scout replaces the bulky printed player packets and gives coaches the ability to enter ratings and textnotes, record voicememos, and take photos/footage for any player at these events on their iPads. Gregg Jacobs, West Shore’s founder and CEO, suggests that the new partnership simplifies the recruiting process for college lacrosse coaches. Early adopters of Lacrosse Scout include US Naval Academy, Christopher Newport University, University of Pennsylvania, Gordon College and Marymount University, as well as 7 collegiate programs in women’s lacrosse. SportsBoard Scout is also available for Women’s Lacrosse, Basketball, Soccer, Baseball, Volleyball, Field Hockey, and Rugby. For more information about West Shore Technologies, visit http://www.sportsboard-win.com. SportsBoard is the first iPad app to give sports coaches an advantage over their competitors in scouting and player assessment.